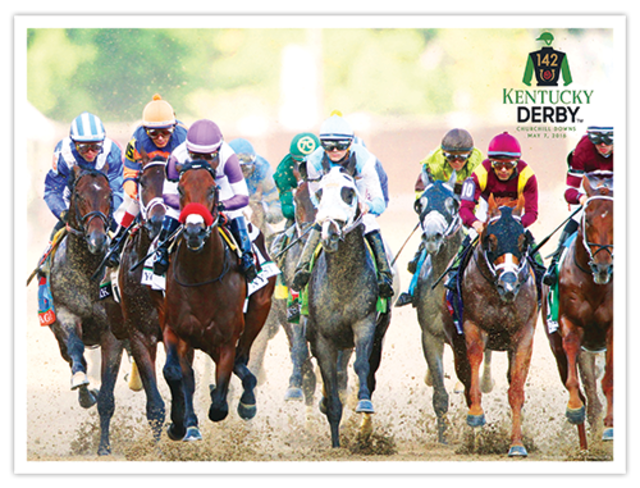 Churchill Downs will distribute 5,000 18” x 24”commemorative posters at its admission gates on Preakness Day that feature a head-on image by Coady Photography of Nyquist’s run to Kentucky Derby glory on the first Saturday in May. Simulcast wagering on the Preakness will be available on Saturday, with post time for the second jewel of the Triple Crown set for 6:45 p.m. (all times EDT). On-track fans at Churchill Downs also will have an opportunity to enjoy a taste of the Preakness with the The Black-Eyed Susan, the event’s official drink that will be available at locations throughout the track. Saturday’s live racing at Churchill Downs includes 11 exciting events topped by the 79th running of the $100,000 Louisville Handicap (GIII) for 3-year-olds and up at 1 ½ miles on the Matt Winn Turf Course and the 11th running of the $65,000-added Opening Verse Overnight Stakes, a one-mile race for older horses on the grass. The Louisville Handicap will be run as the sixth race at 3:16 p.m., while the Opening Verse will go as the last of the day’s 11 live races at 5:52 p.m. Admission gates open at 11:30 a.m. and post time for Saturday’s first race is 12:45 p.m.
Distribution of the Nyquist Kentucky Derby commemorative posters begins with the opening of admission gates at locations just inside of gates 1, 10 and 17. The posters will be available while supplies last. General admission to Churchill Downs on Preakness Day is $5 and box seats start at $10. Reserved seating and dining reservations are available online at www.churchilldowns/tickets or by calling (502) 636-4450. Preakness Week at Churchill Downs kicks-off with the Spring Meet’s second Twilight Thursday celebration on Thursday, May 19. Twilight Thursday offers live music, $1 beers and many of Louisville’s finest food trucks on The Plaza near Gate 1. The Plaza Stage will feature the music of 800 lb. Gorilla and Thursday’s roster of popular food trucks on the Plaza includes ¡Holy Molé!, Longshot Lobsta, Mark’s Feed Store, Red Top Gourmet Hot Dogs and Zoom Zoom Yum. Live music on Twilight Thursday will begin with the 4 p.m. opening of the Churchill Downs admission gates. Thursday’s racing program is highlighted by the fifth-day of a carryover in Churchill Downs’s 20-cent minimum Single 6 Jackpot. There was no individual winner of the Single 6 on Sunday, May 15 so a four-day pool of $379,810 has carried over to Thursday’s wager, which begins in the third race at 6:11 p.m. on an eight-race Twilight Thursday racing card. General admission to Twilight Thursday’s and most Churchill Downs Spring Meet racing programs is $3, with reserved seats starting at $10. The Churchill Downs racing program on Sunday, May 22 includes the return of the Who’s the Champ? Handicapping Contest in the track’s ITW on the Clubhouse second floor at the top of the Gate 17 escalators. Registration is scheduled from 11:30 a.m. to 1:30 p.m. and the contest based on mythical $2 wagers will focus on Races 3-8. The first-place prize in the Who’s the Champ? Contest is a $1,000 cash voucher, with a $500 voucher going to the runner-up and $200 to the contest’s third-place finisher. The entry fee for the Who’s the Champ? Contest is $35 or just $30 for TSC Elite members. After this week’s opener, the Who’s the Champ? Handicapping Contest will be conducted every Sunday through the remainder of the Spring Meet. After Twilight Thursday’s 5 p.m. post time, this week’s Friday and Sunday racing programs, like Saturday’s Preakness Day schedule, will have a first race post time of 12:45 p.m. with admission gates set to open at 11:30 am.